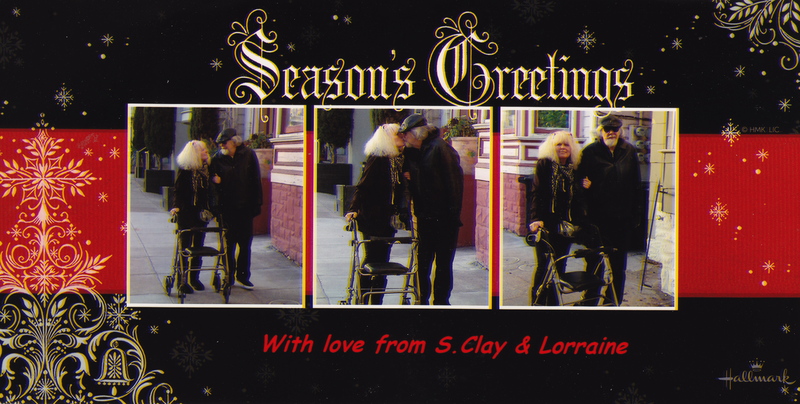 I have hopefully uploaded our Xmas card on here. We actually just share this walker. It’s really for Wilson to sit down on when we’re out on a walk, in case he gets tuckered out for a minute. I hope you all have a lovely Holiday! A few days after bringing him home, I received an automated survey call from UCSF. The last multiple choice question was about how satisfied we were with the stay there. I pressed 2, for only “fairly satisfied”. Within two hours, a live person called to inquire about my answer. I told her about the procedure, then the removal of the mesh. And about them lying to me about his meds. She was pretty appalled, and gave me the address & phone number of Patient Relations, so I could report it. I had already planned to write a complaint, so this made it easier. To wrap this up, one more thing happened to make life a little difficult. I have been experiencing random bouts of nausea, fever, chills, and fatigue. Of course, I just thought I was getting run down, menopausal, or just OLD. On Monday, after leaning against our claw foot tub, scrubbing it, I noticed a bright red area on my left thigh. I thought it was a pressure mark. Later, after taking Wilson out for a walk, I looked at it again, and it was much bigger, and boiling hot! What the hell…blood clot? Allergy? Infection? I raced around, putting things in my backpack, and drove up to the ER at Davies, only a few blocks away. Turns out I have Cellulitis, an infection deep in the tissue. It’s from a bacteria most likely caught in the hospital. It’s a dangerous kind of staph infection requiring strong antibiotics. It has caused excruciating pain in my leg. I have been on the antibiotics for 3 days now, and the redness is going away slowly. But it hurts deep to the bone when I walk, although not as severely as yesterday or the day before. Tomorrow I will have a whole blood panel screening, since I have been experiencing some other mysterious symptoms as well. Might as well get it all checked out! I’m just glad it looks like the antibiotics are having an effect, or they would want to admit me and administer stronger meds intravenously. Just what I don’t have time for! I told them I don’t have time to get sick…I’m taking care of Wilson! Oh, I forgot….since coming home, I’ve had to purée all of Wilson’s food, and even thicken his water. It’s harder than you’d think. The first few meals were a nightmare, using my crummy old broken blender. When I mentioned it on Facebook, only a few hours went by before Ron Turner from Last Gasp showed up at our door with a huge box. It is a deluxe new Ninja blender system! I have since been serving up miraculous meals in creamy swirls for Wilson. I told Ron that I have become POWER MAD, and am roaming the apartment, wanting to purée everything in the house. It’s an incredible device, and has made the tedious process of pureeing everything an enjoyable success. Thank you again, dearest Ronald. Well that’s about it for today. I’ll try to get back soon, and report some hopefully HAPPY holiday news. Happy Holidaze to all of you out there. And many thanks for all the care and generosity from Wilson’s friends & fans.